The New York Times has their anonymous Deep State leakers — James O’Keefe has real people with names, rank and video. Who’s the REAL news network again? 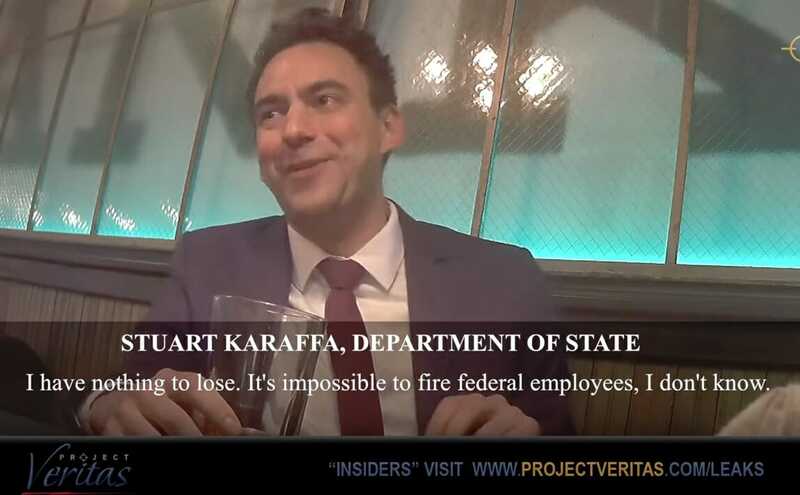 Stuart Karaffa is just the first federal government employee that Project Veritas has filmed in an undercover series unmasking the Deep State. The Deep State is real and dangerous and working in Washington DC to take down President Trump. Here is the first video from Project Veritas’s Deep State series. Why do you think I'd ignore it? This made me chuckle. Careful in all ways, except being a boastful moron while being secretly taped. "The first rule of Deep State Club...."
Don't want you upset at the thought of people trying to expose the Deep State when you don't believe a Deep State exists. Just looking out for you. You realize that this is just one person, right? So, how does this "expose" the Deep State? This is Episode #1 - reportedly there are a good number more. As a self-described conservative - I would think Mr. Stuart Karaffa DSA activities - within our government - would be a concern for you. - But you have lately acted as an Apologist for Russia and the socialist Christopher Steele. > Are you not the conservative as you have described yourself? I am a bot, and this action was performed automatically. Please contact the moderators of this forum if you have any questions or concerns. That's nice, Comrade. It wouldn't surprise me at all if there are a few more. So, again, where's the Deep State? Sure, if this report is accurate, I find his using time on the taxpayer dime to promote left wing activism as an offense that he should lose his job over. Me? An apologist for Russia? How so, comrade? Can you not keep yourself from Donging every discussion you enter? In the first episode. JFC. Well, let's hope Episode #2 has more than one. It takes a lot of people to make a STATE, after all, right? Again - it's interesting to see a self-described conservative attempt to downplay the existence of the Deep State. He is dead now obviously - but JFK spoke to it's existence as a "World-wide" entity. - I am guessing he knew more about the Deep State than either of us. Since JFK is no longer available to help us further understand the Deep State - and you express an interest - this 'fellow conservative' just wrote a book about the topic. Jason Chaffetz: "The Deep State is real – I've seen it up close and it's far worse than you can imagine. What I witnessed and wrote about in my new book –“The Deep State: How an Army of Bureaucrats Protected Barack Obama and is Working to Destroy the Trump Agenda” – was a bureaucracy that allowed agencies to become weaponized in the service of political battles." > Do you doubt the former conservative congressman's description? - Obviously, he is describing more than "one person." You do realize that JFK was a Democrat, right, comrade? Why do you bring him up while flailingly attempting to attack my conservative credentials? I don't know much about Chaffetz, but he's entitled to his opinion and I hope his book sells well amongst Trumpers. They are easily-sold, of course. Yes - I am well aware that JFK was a Democrat. - I am also aware that many people 'today' that call themselves Democrats would never vote for the man. - He was far more conservative than many Neo-Con Republicans that we see in politics today and the last 30 years. > You have "conservative credentials?" Oh good. You know our history. Of course I do, comrade. Why do you ask? My parents were both straight line Democrats all their lives. I doubt if either of them would be Democrats today if they were still around.